Models 34, 342, 36, 362, 363 & Beta. These are all pre-owned. 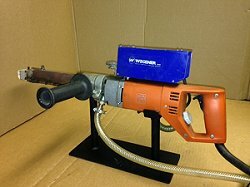 We feel these are the finest handheld extrusion welders available. They are medium and high output and are very dependable. 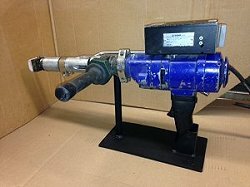 These welders have been run and checked out in our shop and all have a 30 day warranty. They include: operating instructions, stand, and 10 pounds of 3/16" PE welding rod (natural or black). 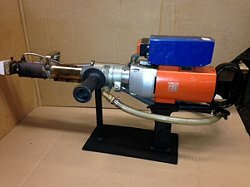 The motor brushes are the highest wear item on the welder and they have either been replaced or they are in like new condition. These German made welders are the standard of the industry and what everyone else copies. 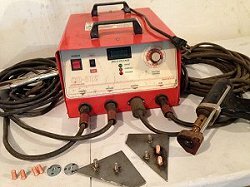 We have used these models of welders for more than 20 years and are highly pleased with them and you will be also. Price range: $2500 to $4000. 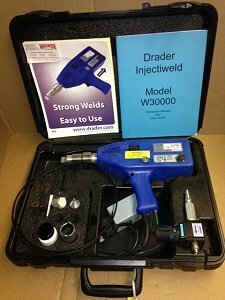 Drader Injectiweld W30000 – New and pre-owned. We are a dealer. These are the best small repair welders on the market. We use them in our shop almost every day and have found them to be very dependable. They work well with material up to 1/4” thick. Their volume output is slow compared to a Wegener. They are great for repairs, small fabrication, spot welding and automotive repair. These Draders have been checked out in our shop and have a 30 day warranty. They are shipped in a plastic carrying case with a few pounds of 5/32” PE welding rod (natural or black) and two tips (3/16" fillet tip and a spot welding tip). Extra tips are $80.00 each. We will include studs and spanner nuts, everything you need to start welding.